This year, the global networking initiative Joint Forces for Solar are starting their program with the branch meeting in Riyadh, Saudi Arabia. Over 150 decision-makers and representatives from politics, the economy and research are coming together for a day-long event to explore and discuss the future market potentials for solar energy in Saudi Arabia. On 20th of February, Joint Forces for Solar will be starting their yearly event program with the first networking event in Saudi Arabia. At the "PV Briefing & Networking Forum Saudi Arabia", local decision-makers and branch representatives will be discussing the importance of solar energy in the MENA region, and especially Saudi Arabia, with international guests. The Saudi government's plan is to increase the country's solar energy capacities to 41 gigawatts by the year 2032, say the initiators EuPD Research and Intersolar in advance of the meeting. The industrial-political and economic frameworks necessary to facilitate such an increase will be the topic of discussion during the event. The most high-profile local partner and co-host of the briefing is the Saudi Arabia Solar Industries Association (SASIA). The founder of this organization, Browning Rockwell, will be leading a panel on the topic "Unlocking the Full Potential | Sustainable Business Cases for Saudi Arabia" in the afternoon. The initiators are also especially pleased to announce plans for the signing of a memorandum of understanding (MOU) with regards to the close cooperation of Joint Forces for Solar and SASIA as strategic partners in the region. Alongside Markus A.W. Hoehner, CEO of EuPD Research and initiator of Joint Forces for Solar, the event will also be opened with a keynote speech by Amer Kayani, leading economic attaché of the US embassy. Governor Dr. Abdullah M. Al Shehri, chairman of the Electricity & Co-Generation Regulatory Authority will also be delivering his opinion on the current market situation in Saudi Arabia. The afternoon session will be opened with a talk on the economic and political frameworks for the solar industry in Saudi Arabia by Khaled Masri, Managing Director of Standards Associates. A white paper by Khaled Masri entitled "Leading through standards: Modernizing Saudi Arabia’s quality infrastructure will improve competitiveness of its emerging solar industry" is available in advance exclusively on the Joint Forces for Solar website. Joint Forces for Solar's "PV Briefing & Networking Forum Saudi Arabia" is supported by the premium sponsors Conergy Asia & ME, Manz AG and Schletter GmbH. The event, which will take place in cooperation with the local partner and co-host Saudi Arabia Solar Industries Association (SASIA), is also supported by the Gold Sponsor Jinchen Machinery and the Silver Sponsor Al Hagbani Energy. Further partners are: The Electricity & Co-Generation Regulatory Authority, Norton Rose, NUMOV, PV LAB Germany, Saudi Arabia AHK, Standards Associates and TaylorWessing. Media partners of Joint Forces for Solar are: PV-Tech, pv magazine, Solar Server, Sun & Wind Energy and Renewable Energy World. 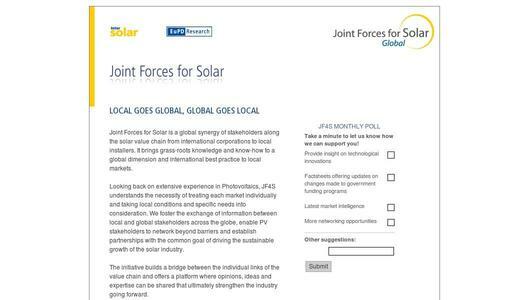 Further information on the Joint Forces for Solar Initiative can also be found on their website: www.jointforces4solar.com. Intersolar abides by the guiding principle Connecting Solar Business. Intersolar is the world's leading exhibition series for the solar industry. With 20 years of experience and over 3,100 exhibitors and 100,000 visitors spanning three continents, Intersolar has the unique ability to bring together the solar industry from the most influential markets around the world. Intersolar's global events take place in Munich, San Francisco, Mumbai, Beijing and São Paulo. The organizers of Intersolar Europe are Solar Promotion GmbH of Pforzheim and Freiburg Wirtschaft Touristik und Messe GmbH & Co. KG. Intersolar North America, Intersolar India, Intersolar China and Intersolar South America are organized by the international subsidiaries Solar Promotion International GmbH of Pforzheim and Freiburg Management and Marketing International GmbH. The Saudi Arabia Solar Industry Association (SASIA) is a non-profit, non-governmental organization that brings together the national and regional solar industry. Our goal is to transform Saudi Arabia and the Middle East’s vast solar potential into a commercially and environmentally viable solution for our growing demand for electricity. SASIA provides its members with services such as educational workshops, networking functions and special reports on breakthrough solar innovations. We also provide assistance to international companies seeking to expand their solar operations in the Kingdom of Saudi Arabia and the Middle East. The association is currently working on initiatives that bring together leaders from the policy sector, academia, and the private sector. The MENA Solar Brief, a monthly newsletter produced by SASIA goes out to over 1,700 +readers in the Middle East renewable energy space.